Drawn to the Exhibition Centre were lightweight construction experts from a range of sectors. Lightweight construction represents one of the greatest opportunities and prospective growth areas for the fiber composites industry. Demand in Europe is on the rise, and the sector is looking to the future with optimism – especially in Germany, a hub of innovation with above-average increases in the production of lightweight materials. The positive mood was reflected as well at the 10th Composites Europe, where the anniversary event from 22 to 24 September 2015 set new records all around – in terms of exhibitors, visitors and exhibition space. The trade fair for fiber-reinforced plastics has been on an uninterrupted growth path ever since the event first took place. Composites Europe 2006 kicked things off with 168 exhibitors. 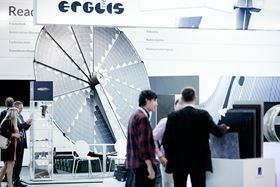 When the event cycled back to Stuttgart this year for the tenth anniversary, 470 companies (prior Stuttgart event in 2013: 405) from 29 nations exhibited and filled three exhibition halls for the first time. With 10,087 visitors in attendance (2013: 9,171), Composites Europe set yet another record. Drawn to the Exhibition Centre in Stuttgart above all were lightweight construction experts from the automotive sector, aerospace, mechanical engineering, the sports and leisure industry, wind power, and the construction sector. 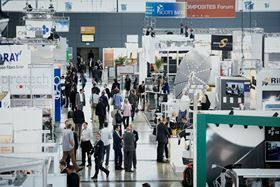 What's more, Composites Europe has long been known as an important gathering place for the international industry: nearly half of all trade fair visitors (45%) came from outside Germany, with one in eight (13%) hailing from overseas. ‘Over the last ten years, Composites Europe has built an inclusive cross-sectoral network, which today benefits the entire composites industry. In this function, it is one of the most important international relationship brokers today,’ said Hans-Joachim Erbel, CEO of Reed Exhibitions Deutschland GmbH, the organiser of Composites Europe. Lightweight construction represents one of the biggest challenge areas. The highest growth rates are being posted by the composites industry in Germany: the largest market for fiber-reinforced plastics in Europe is set to grow by 6% in 2015, followed by the Eastern European countries (4%) and UK/Ireland (3%). The main purchasers continue to be the transport and construction sectors, followed by the electrical/electronics industry, and the sports and leisure industry. Trade fair visitors are also confirming the excellent economic prospects enjoyed by fiber-reinforced composites: 72% of respondents expect their respective sectors to experience upward economic momentum in the next three to four years. Only 18% forecast their industry to stagnate. The event welcomed 10,087 visitors. A representative survey of trade fair visitors has shown that lightweight construction represents one of the biggest challenge areas for the industries that use fiber-reinforced plastics. About half consider lightweight construction a priority when it comes to developing innovative components, followed by the reduction of materials costs, automation and shorter process cycles. Supplementing the exhibition area at Composites Europe was an extensive congress and lecture programme that provided an outlook on the future of lightweight construction. Two new events premiered at Composites Europe: the 1st International Composites Congress (which succeeded the former AVK Conference) and the bio!CAR Conference. ‘Composites Europe is an indispensable market staple. The response has been excellent again this year. We consider Composites Europe our trade fair partner – now and in future,’ said Dr Elmar Witten, the management spokesman of Composites Germany. The significance of multi-material composites – metal-plastic hybrids, in particular – in the automotive engineering and electronics sectors was also on display at the parallel event HYBRID Expo, which was staged for the second time in Stuttgart. A total of 70 international exhibitors, including many major industry players from mechanical engineering, toolmaking and R&D as well as numerous complete-solutions providers, presented the entire process chain for the large-scale manufacturing of hybrid components. A special focus at the trade fair was on process integration and acceleration during the production of metal-plastic composites. A total of 2,962 visitors attended this year's HYBRID Expo. This story is reprinted from material from Composites Europe, with editorial changes made by Materials Today. The views expressed in this article do not necessarily represent those of Elsevier.